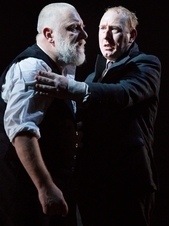 It's so exciting when a new production is a major cultural event and that's certainly been the case at the National Theatre recently where Oscar winning director Sam Mendes has directed one of our finest stage actors, Simon Russell Beale, in Shakespeare's greatest play, King Lear on the Olivier stage. Apart from his acting credentials, Russell Beale is not an obvious choice to play the old king who loses his power and reason when redistributing rule amongst his ruthless elder daughters. He neither has the natural frailty of a man in decline as Olivier had in the seminal TV production, nor the towering physicality of a "raging bull" Lear as epitomised by Frank Langella recently in Chichester and New York. Russell Beale is short and stout and at 53, comparatively young to be portraying the onset of dementia. The director and actor then need to completely re-invent the role for this production which they succeed in doing quite brilliantly. The setting the director conceives is an essential component in defining a new Lear. In this case Mendes uses the vast Olivier stage to create an imposing, militaristic environment employing modern dress. Thirty soldiers flank the opening action where the uniformed Lear, sits with his back to us and barks instructions into a microphone to courtiers sat at perfunctory metal tables. The whole aesthetic is reminiscent of scenes we see on the news of the dictatorship in North Korea. This king is bald, bullet headed with a full white beard. He looks like a psychotic gnome striding about the stage flinging tables around with rage and is utterly terrifying. The only softness and humanity come from the sight of the fool (Adrian Scarborough) crouched incredulously behind the throne. Lear's offspring, Kate Fleetwood as Goneril and Anna Maxwell Martin as Regan shimmer in elegant cocktail dresses looking glacial and unyielding. Further opening scenes are set in the shadow of a soviet style statue of Lear. A wonderful touch that allows us to contrast his image of himself as a mythological hero with the reality of the spluttering, confused despot scurrying beneath. As the storm to which Lear is consigned builds, the scenic elements are stripped away until a simple ramp rises up providing a high precipice from which the king can rant at the elements. The ensuing three hours chart his descent through murderous ranting to peace as, still incredulous, the monarch diminishes physically and vocally to something approaching a human being. This being the National, the supporting cast are top notch too but also relish the chance to take a different approach to their roles. Stephen Boxer as Gloucester and Sam Troughton as his treacherous son Edgar present two buttoned up, pinstriped courtiers. For the father the suit is a symbol of respectability, for the young man it's tailored armour that compassion cannot penetrate. In this production it makes perfect sense that the second son, Edmond (Tom Brooke), sheds his suit to rail, naked, against the palace from the desolate wasteland without, in the guise of Poor Tom the lunatic. One of the eternal puzzles of the play is why The Fool, so prominently featured in the middle of the play, is completely absent from its conclusion. Mendes solves this with a shattering coup as Lear and the Jester shelter from the storm in Poor Tom's hut. Goneril and Regan may be conventionally haughty and cruel but I've seldom seen them played so viciously. Maxwell Martin's nasty little laugh at moments of horror is particularly chilling and the blinding of Gloucester following his water boarding is achieved with maximum impact. All things considered this is genuinely unmissable. If you're new to Lear, it's a clear, uncluttered account, the perfect introduction. If you're a Lear veteran, the freshness of the ideas will keep you hooked and allow you to rethink your preconceptions of the piece. Either way this production will lodge itself in your mind for life.